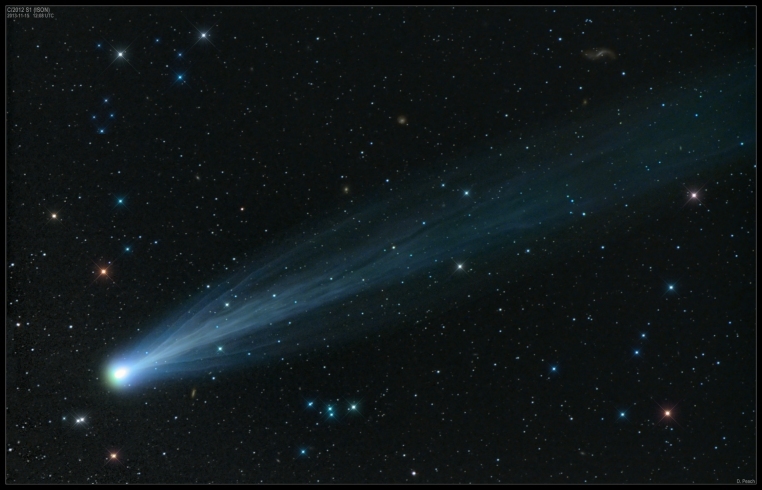 Once again we have the opportunity to catch view of a comet over the next several weeks. 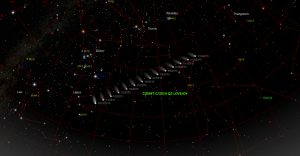 Comet C/2014 Q2 Lovejoy is making its way through the solar system. 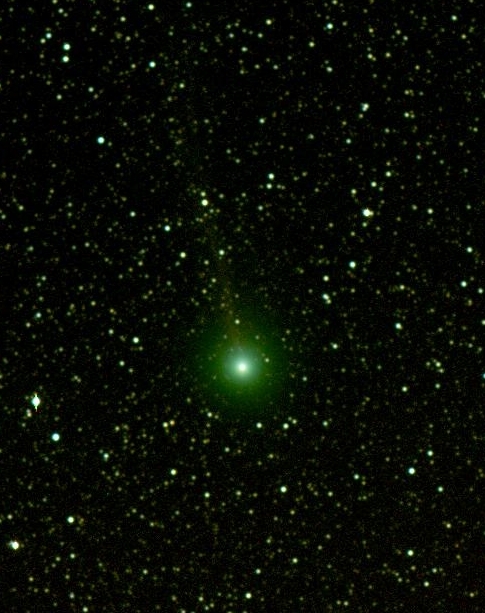 As you may have noticed, there are several other postings about a comet Lovejoy, this one is different. Typically comets are named for the person (or group) who discovered them and this is another in a series of discoveries by Terry Lovejoy, the 5th to date. The picture below was taken using the BRT scope on a scheduled job that completed on December 25th. This is a black and white photo at 120 seconds of exposure with a narrow field camera. 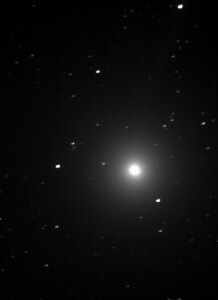 On over-exposing the image, the tail comes out but without the over-exposure, only the comets nucleus is clearly visible, seen as the bright spot of fuzz in the image below. The tail extends toward the upper right of the image. Another image is included later in the post. This comet will make its way through the solar system toward the Sun and out without a return for another 8,000 years or so. The best chance to view it will be over the next few weeks as it gets brighter and brighter arriving at its closest distance to Earth on January 7th while it will continue to brighten through its closest encounter with the Sun on January 30th. However, by that time, the comet is expected to begin dimming from our view because of its distance from us (around 120 million miles away by that point). The image below was also captured using the BRT array by another user who managed to catch a great shot using the camera designed for taking pictures of star clusters. Also taken on December 25th, this picture is also at 120 second exposure and in normal color. To view the comet, over the next several weeks you'll want to look in the general area below the constellation Orion the Hunter. As of this posting, the comet is about 13 degrees beneath the brightest, lower right hand star in Orion known as Rigel; a blue supergiant at 772 light years away. The comet is currently in the constellation Lepus the Rabbit and will be traveling upwards relative to the horizon night over night following a path that will take it beneath the constellation Taurus the Bull and The Pleiades open cluster. I have made a few charts which may help locate the comet, they are included below. Comet Q2 has brightened faster than many anticipated and while the comet is visible to the naked eye currently at around a magnitude of 5 (naked-eye brightness is generally accepted to be anything below magnitude 6), if you have them, definitely use binoculars to get a good look as the comet isn't very easy to spot without a dark sky and good vantage point. The best time to view the comet will be between around 10:30 PM and 1:30 AM local time as the comet will cross due South around Midnight reaching an altitude of around the 30 degree mark. For the next few days, Orion and the comet will rise at around the same time so if you have a great view of Orion, you can probably also look for the comet. Please remember that the comet will move quickly across the constellations in the sky so adjust your viewing over the next several days as it moves towards the constellation Taurus. 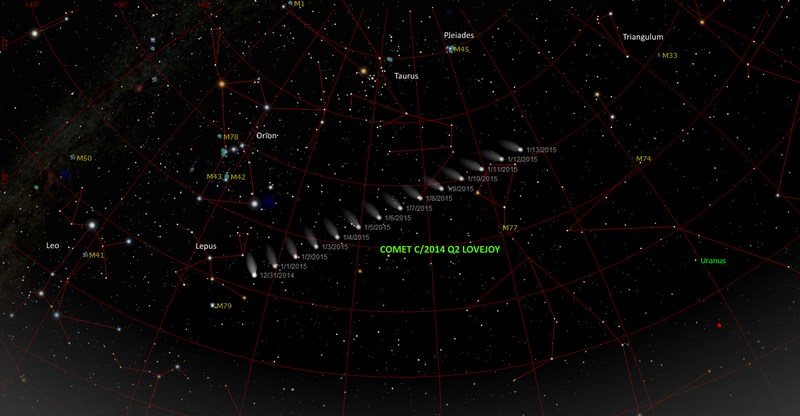 Click on the image below for a larger view of the comet path over the next 15 days. Viewing of Comet ISON should begin to be possible for U.S. observers beginning tomorrow morning. See below for chart images that may provide additional help in locating the comet. You'll be looking for a fairly bright object in the Eastern sky right before dawn. From experience, I recommend being outside with a very clear view to the Eastern horizon about 15 minutes before the comet is ready to come above the horizon. The first thing you'll probably see is the Sun lighting up airplane contrails as it gets closer to rising. Don't mistake these for comet tails! Comet ISON (even though it's traveling away from the Sun) will look like it's pointed at the sun (tail shooting up into the sky toward the zenith. For the midwest (and probably transferable to the rest of the U.S.) you should expect the comet rise time to be around 6:40 AM local time. Since it will cross the horizon at that time, I would expect it to become visible sometime between 6:55 AM and 7:10 AM local time. 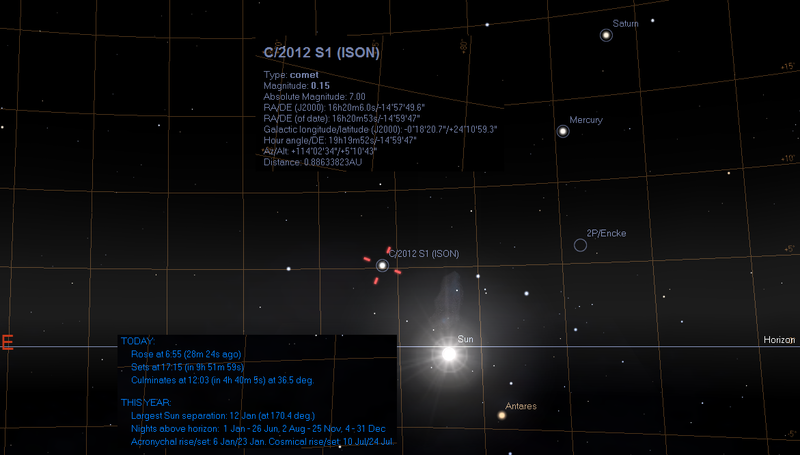 Comet ISON should be about 7 degrees above the horizon at around 7:20 AM local time. Keep in mind, this may vary due to any number of factors of your locale but should be close. If you've not seen the comet by around 7:25 AM local time, there's a good chance it's not going to be visible as the Sun's brightness will drown out the ability to see ISON. 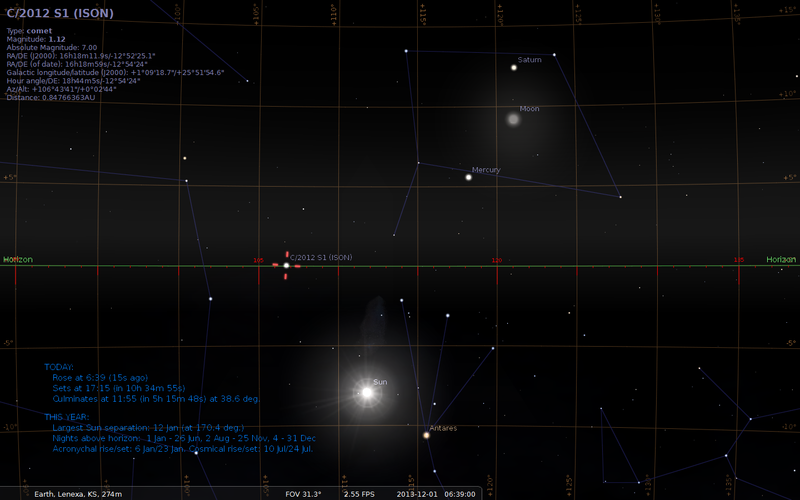 I have added two images from Stellarium which show the sky configuration at 6:39 AM and 7:20 AM respectively. 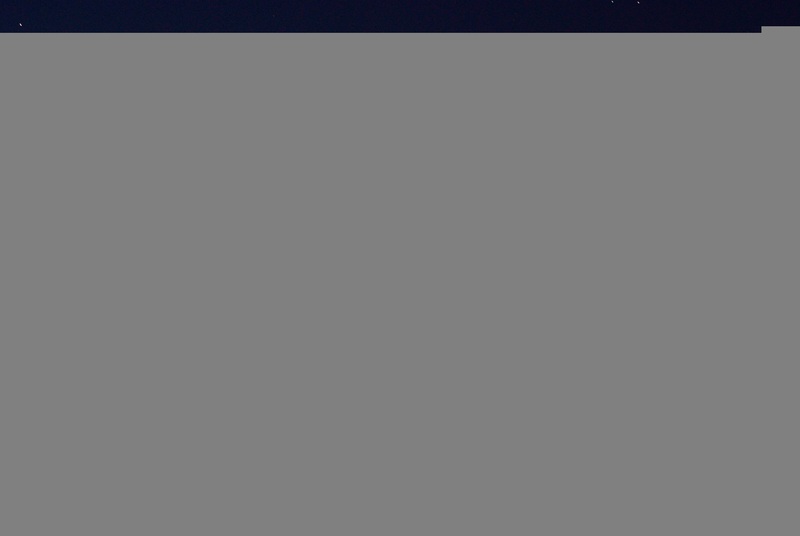 I have also added the latest pictures of the Moon, Jupiter, Mars and a sunrise to the album for November 29th. Comet ISON has made it around the Sun at least partially intact! This is great news for those who are looking for an opportunity to see this comet. The current magnitude is almost -1 which means it should be easily visible to the naked eye as it comes back around the Sun to be visible once again in the morning skies. On November 30th, you may be able to see the comet if you're up early enough. The comet is set to rise starting at 6:55 AM CST in the Northeast sky (see graphic for coordinate information) and may be visible up to just before the Sun rises at 7:26 AM CST. It is not yet known how long the comet will remain viable. There were some concerns that it might not even make it through the approach. Especially (as can be seen in my previous post of SOHO images) since the comet showed some active disintegration and disappeared for a bit on it's way around the Sun. There is an expectation that better information about the comet, and how stable it really is, will be coming out over the next few days as more observations are able to take place. In the mean time, I took the liberty of doing a little bit of astrophotography this evening with my Nikon D80, 70-300mm telephoto lens and a tripod. While this is certainly not an ideal setup, it still manages to capture a few shorter exposure shots well enough. I had two goals with this outing, the first was to see if there was any way to snag comet ISON this evening after sunset since the Sun set prior to the comet. Alas, this was a bunk effort not only due to the bright sunset but because of low clouds in the Western sky. Even so, those clouds made for some very nice sunset photos (see gallery). The second goal was to see if I could capture Comet Lovejoy. This comet has gone from naked eye visibility in mid-November to binocular, telescope and photo visibility at this point running around the 7-8th magnitude for right now (it's only going to get dimmer from here). I pointed my camera at roughly the spot where I expected it should be and started snapping a couple pictures. Unfortunately, my electronics weren't working well tonight and I wasn't able to look up the exact position of the comet and get better pictures while zoomed in. But, to my surprise, I DID snag some faint shots of it without any zoom. While these shots are very clearly not very good, the accomplishment is that something was obtained. One other thing to note is that aircraft were everywhere tonight and interfered with several of the shots that I kept. Happy comet viewing everyone! Keep checking in for updates, I will post more as I have them. 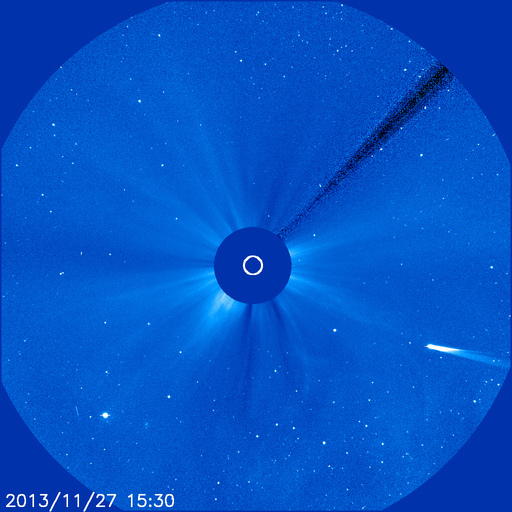 See full article for images and after Thanksgiving sky location for Comet ISON. Finally, the heavens clear and the Sun appears. Too bad for me it's a day or two late to capture final pictures of Comet ISON before it passed out of visual range. Right now the comet is on it's way around the Sun and is too close to be visible until after Thanksgiving. 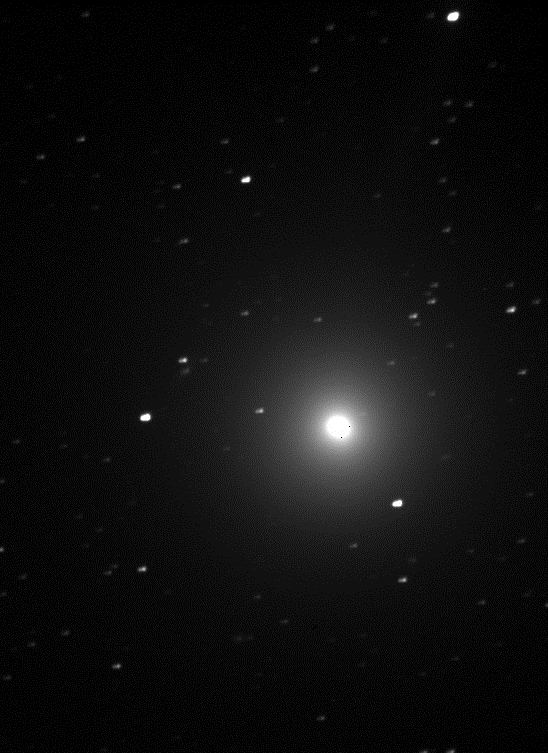 Fortunately for you, I've found a few pictures of ISON to share which dwarf anything I'm currently capable of providing on my own. And the the most spectacular shot I've seen to date. This has so much stunning detail it looks like a painting. Taken by Damian Peach (http://www.damianpeach.com) on November 15th 2013. This picture was captured using the following settings and equipment: 0.11m F5.6 STL-11k camera. LRGB: L: 5x2mins. RGB: 1x2mins. Viewing the day after Thanksgiving will still be a formidable challenge because (assuming the comet survives the trip around the Sun) ISON will still be very close to the Sun angularly. You'll want to look very close to the horizon where the Sun set after sunset about 4:45 PM to 5:00 PM local time. At this time the Sun will only be a few degrees below the horizon and ISON will only be a few degrees above it. This also means that you'll need an extremely good Western vantage point. 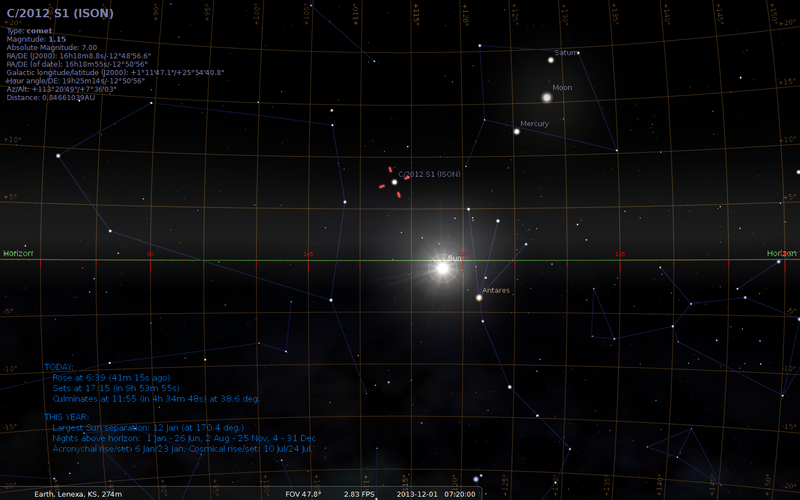 The picture below provides a rough idea of where the comet will be with respect to the Sun. The blue line represents the horizon line. Keep in mind this picture does not take into consideration horizon obstructions such as buildings and trees or any atmospheric problems such as the sky being too bright or overcast. By Sunday, the comet will be a little bit further away from the Sun and should provide an easier sight. While the comet will continue to be an early evening object (which is great for anyone who's not a night owl) it should be a naked eye sight through the first several weeks in December, depending on brightness, maybe longer. You will still find it best for observing the comet if you find a clear sight with a vantage point that gives you an unobstructed view of the Western horizon. Continue to look for it in the very early evening sky right after sunset. Happy Thanksgiving and happy viewing! Keep an eye out for updates on this as the comet swings around the Sun. 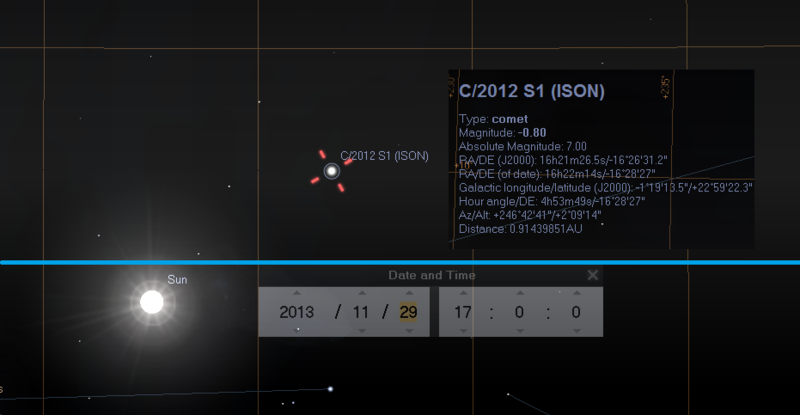 Unfortunately for me, Comet ISON has been extremely elusive. Inclimate weather has been passing through the midwest leaving only a few days where observing might have been possible, albeit with low temperatures. I made one serious attempt to capture a glimpse of the comet and photograph it using my 6" refractor but unfortunately the outting was riddled with technical problems and yielded nothing more than very cold hands. As you can see by the chart included below (courtesy of Skymania), the comet is getting closer and closer to the horizon for it's Thanksgiving rendesvous with the closest approach to the Sun that it will make. While the comet is ellusive, if you get the opportunity to be up an hour to 30 minutes before dawn with clear skies over the next several days you may be able to catch a glimpse of it with the naked-eye near where sunrise will occur. You should look for a fuzzy, bright, tail pointing straight up towards the zenith. 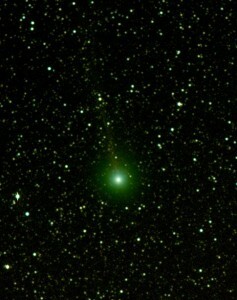 This comet is special in a couple of ways. The first is that it came from the Ort cloud, a group of comets and various debris left over from the formation of the solar system. This area is 2,500 times further away from the Sun than Pluto which means it started traveling toward the Sun over a million years ago! This also means that it won't be back anytime soon, probably ever. Now, assuming the comet makes it around the Sun over Thanksgiving, which is not certain right now, there is expected to be some spectacular viewing of it between Thanksgiving and Christmas as ISON begins its very long journey out of the solar system. Keep an eye out for pictures and updates on the comet. I'll be posting relevant information and pictures as I take them.